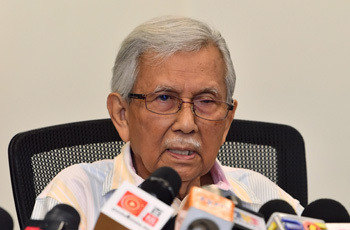 KUALA LUMPUR: The Pakatan Harapan government needs to concentrate on delivering its promises to the people who voted them in during the 14th General Election and to forget what happened in the past, says Council of Eminent Persons (CEP) chairman Tun Daim Zainuddin. He said what happened in the past is history, and the new administration should stop pointing fingers at the previous government that ruled the country for the past 61 years. “Six months is enough. Now the government needs to concentrate on delivering. People know what happened and that’s why they voted the previous government out. So it’s important for them not to repeat similar leadership (mistakes),” he told reporters at the Affin Hwang Capital Conference Series 2018 here yesterday. Daim said the government should work towards restoring confidence among investors in order to attract them back to the country. “In the last six months, the government has made itself clear on what needs to be done and has started to take many steps, some big and some baby steps, and yet our destination is still far away,” he said. “People are impatient, they voted for change and want to see results immediately. Promises were made but when the PH government took over, it suddenly found that the treasury was empty. “How are they going to fulfil the promises? So it will take time,” he said. “I don’t want to remain at the position, that’s why I retired,” he said. Asked to comment on the 2019 Budget, he said it is in line with the journey of the new Malaysia. On Nov 2, Finance Minister Lim Guan Eng tabled the 2019 Budget with an allocation of RM314.5 billion, an increase of RM24.1 billion over the RM290.4 billion in Budget 2018, while Budget 2017 was allocated RM260 billion. Daim stressed that capital control may not work for Malaysia now as market conditions have changed, compared with the 1997-1998 Asian financial crisis. “The same policy will not work today and my advice to the government is not to implement capital controls now,” he said. Next Article DNC: Why blame Baru Bian on perimeter survey funds?